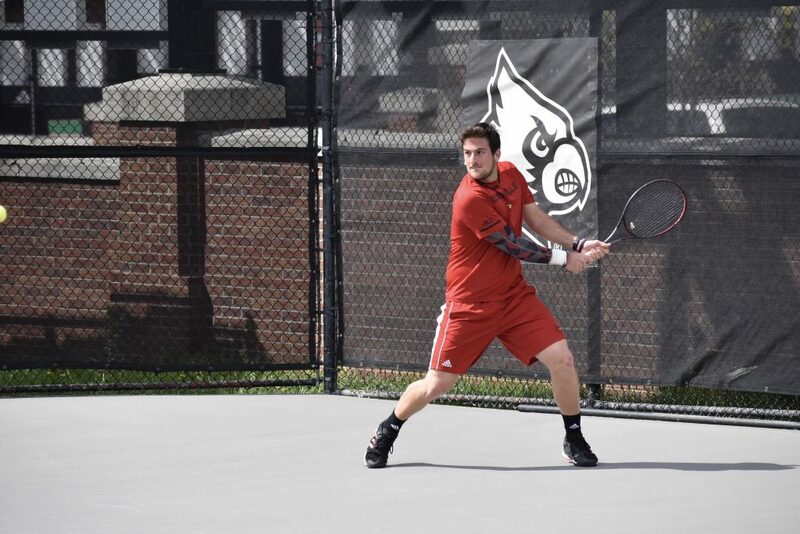 Men’s tennis (15-11) hosted Virginia Tech this Friday, April 12. What started out looking like a win, turned into a 4-2 loss against the Hokies. The Cards now hold a 3-8 conference record with one match left before the ACC Championship. The doubles lineup was quite different than usual with seniors Christopher Morin-Kougoucheff and Brandon Lancaster at the No. 1 spot, seniors George Hedley and Federico Gomez at the No. 2 spot, and freshman Sergio Ramirez and Fabien Salle at No. 3. Hedley and Gomez brought in an easy 6-2 win over Jason Kros and Brandon Perez (VT). To clinch the doubles point, Ramirez and Salle took down Carlo Donato and Alex Ribeiro (VT) 6-4. Kougoucheff and Lancaster were up 6-5, but their match was left unfinished. The singles lineup had some new additions with Kougoucheff at No. 1, Lancaster at No. 2, Ramirez at No. 3, Salle at No. 4, Gomez at No. 5, and freshman Alex Wesbrooks at the No. 6 spot. Lancaster fell to Henrik Korsgaard (VT) 6-3, 6-3, tying up the score. The Cards fought back on court one as Kougoucheff defeated No. 71 Jason Kros (VT) 6-4, 6-3. To even the score once again, Wesbrooks fell 7-6, 6-2 to Evan Fragistas (VT). Gomez lost 6-0, 4-6, 2-6 in the third set to Brandon Perez (VT), making the overall score 3-2. Virginia Tech got the last point they needed on court four when Carlo Donato (VT) defeated Salle 6-3, 2-6, 1-6, leaving the Cards with a 4-2 loss. Men’s tennis hosts North Carolina for their Senior Day this Sunday, April 13 at 1pm at the Bass Rudd Tennis Center.